Ava Taught Me and First Impressions of 2015. I wrote something about Ava Duvernay and black women bold enough to interpret history — their own and others’. I published it at Medium, rather than posting it here, because it didn’t feel like it was a fit for this space. Every January, I reassess what I want to do with this blog. Every year (for the seven it’s been in existence), it serves the purpose it’s meant to. I was fortunate enough last year to have appearances and publications to announce, as well as meditations on news and culture to publish. I’m not sure what 2015 will hold. Maybe more of the same. Or maybe the landscape will change. I just know this year has been strange so far. First, I was paid an extra month’s salary for my last contract job. It was an oversight. But it was I’ve never been on the receiving end of that kind of financial oversight: a full check — directly deposited — for the entire month of December. I didn’t work the month of December; my contract ended on November 30. I really, really could’ve used the money. Seeing my account balance after its deposit really drove home that point. And it wasn’t clear how soon anyone in accounting would catch the error (if ever). Of course I knew I couldn’t keep the money. But knowledge and action found themselves briefly at odds. The first thing I did was start telling people*. And the first person I decided to tell was a great friend who I suspected — but wasn’t entirely sure — would see things as I did. In situations like these, when I need a minor pep talk to prepare myself to be as ethical as I know I have to be, the people I consult have to be people who won’t tempt me. They can’t be people who’ll remind me that I’m not working or point to the bills I could pay with the money or spend a half-hour calculating an invented New Math about labor-to-time-to-worth-to-pay ratios. I just need someone who will calmly confirm what I need to do. In this case, I chose the right person and set about doing the right thing. (If that pays off in any obvious, estimable karmic way in the future, I’ll let you know). What the incident reminded me is how closely we have to monitor our ethics, how intentional we have to be about listening to our consciences. People always talk about listening to your inner voice — and/or to the still, small voice of God — but that isn’t always the immediate, logical response. You have to quiet worry — which is loud — and your propensity for sketchiness, which can be quite imperceptible at first, in order to follow the suggestion of your conscience. The only other big thing that happened this year is that, in catching up with a friend I rarely get to talk to, I accidentally texted the very person we were discussing. And what I was saying wasn’t glowing. It was hurtful and infuriating to the unintentional recipient and it severed an already taut, hair-thin cord we’d both been working hard to hold up at its ends. What that incident is teaching me is that I am not the same person to everyone. To some, I’m caring and kind and generous and fair; to others, begrudging, bitchy, and patently unfair in my characterization of them. As a person who often wants more than anything to please and to remain unobjectionable and inoffensive — even at high personal cost — it bothers me a great deal to know that I can be hurtful and nasty, ferociously unlikable. It scares me, in fact, because I am inclined to believe the worst about myself. If I know that someone I care about finds me hurtful or given to betrayal of confidence, or inflexible or unforgiving, even cruel, I worry that he isn’t the only person who sees me that way — or worse, that I’ll eventually reveal myself to be that way with everyone I love. But what’s real is that every person views us a bit differently than the next — which means that each encounter with any of them gives us a new opportunity to be the version of ourselves we hope (but often fail) to be, with everyone. We have an inexhaustible capacity to be incredible for some and deeply offensive to others. And when we have been the latter, there may be no convincing the offended party that we can be better to them than they’ve experienced us to be in the past. Sometimes, we have to settle for being someone’s personal definition of terrible. I apologized. The jury’s still out on whether or not it will be accepted, but I think in accidentally revealing what’s frustrated me, I feel like a more genuine, if less likable, person. Losing my place in a person’s high esteem feels worth it if, in the end, I’m not pretending to be better than I actually am. … At least that feels like the lesson today. Check back with me in a week or two, and I may sound like someone else entirely. 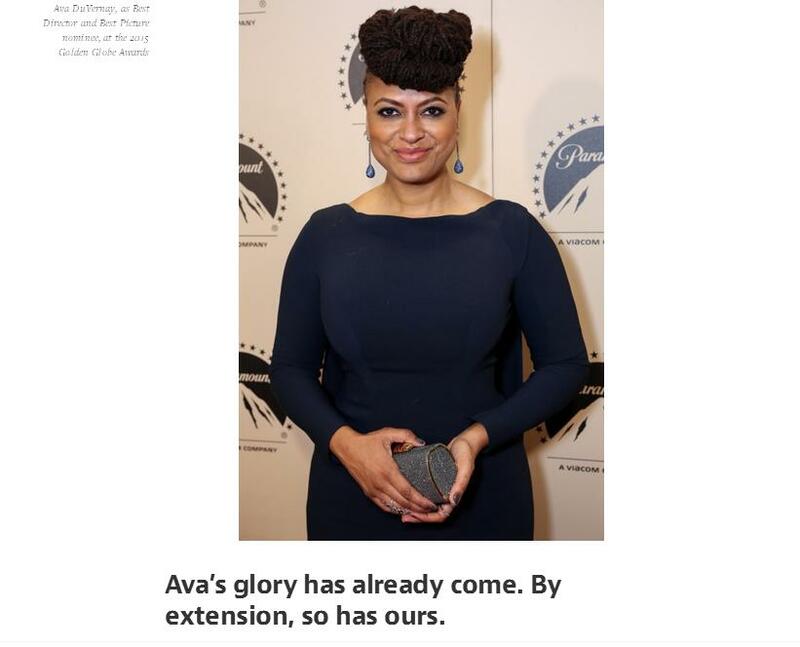 Read the DuVernay piece. I’ve been told it’s not too shabby. I hope you’ll be able to concur. * I tell someone nearly everything about myself. I don’t know why; the reasons change. The person changes. It’s part accountability and part confession/absolution. Sometimes I just need confirmation that I’m not irrational — or that I am. I’m not a talker, by any stretch, but as someone who spends as much time close-lipped as I do, I’m a near-full discloser. Secrecy, in my personal experience, has proven overrated. Discretion, on the other hand, has value beyond measure.